When you think of Tenerife, you probably visualise non-stop sunshine, Brits abroad, maybe volcanoes…. but certainly water parks! I love a good theme park, but the water equivalent has never really done it for me. Perhaps it’s because I don’t enjoy being damp all day, or because being thrown down a dark tunnel where you feel very close to death and having water thrashed in your face reminds me of illegal torture. 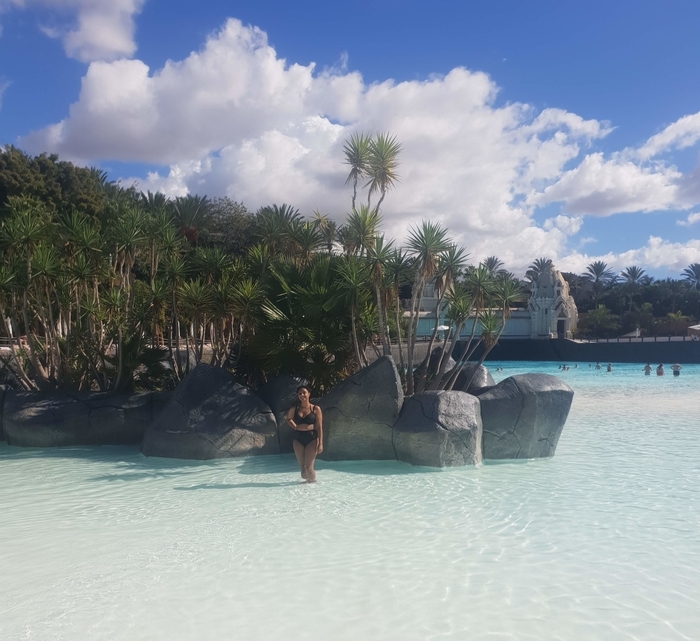 Be that as it may, I recently went on a day trip to Tenerife’s Siam Park and it was an absolute hoot and totally changed my opinion. Here are my top tips and highlights. Entry to Siam Park isn’t cheap (37 euros for adults and 25 euros for children), and apart from bottled water you can’t bring in any food or drink, forcing you to refuel at the pricey fast food restaurants. 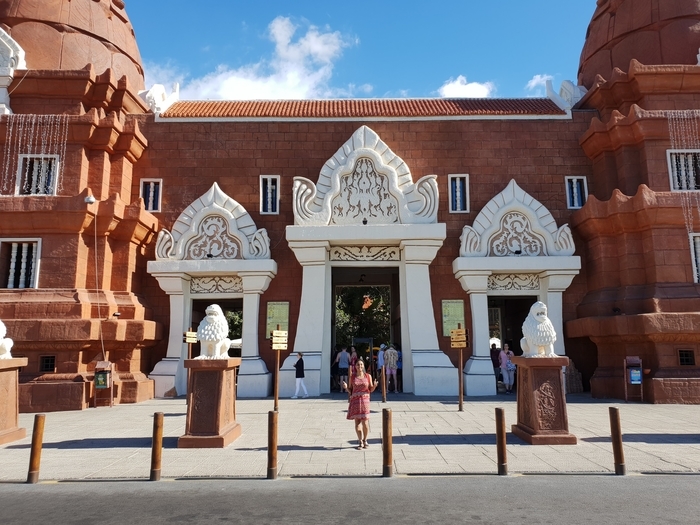 To manage your budget, I’d recommend ditching the taxis and opting for the local green buses; they are very comfortable and many serve Siam Park. The cost will depend on the distance – we took the 437 bus from Callao Salvaje and it was 2.50 euros each way. 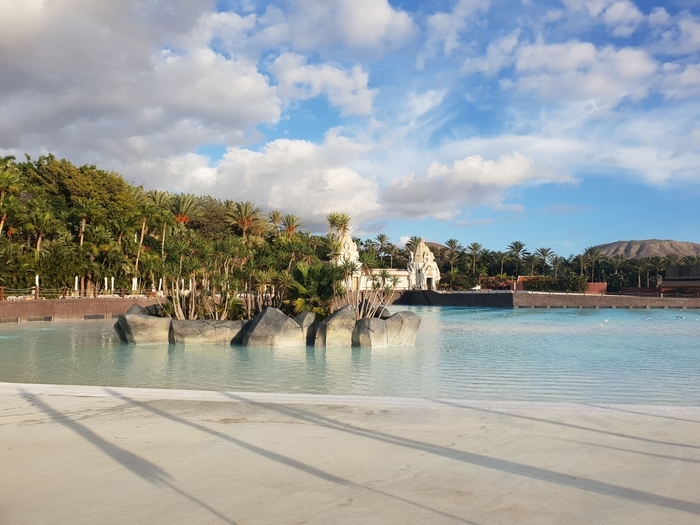 Alternatively, there is a free bus specifically for Siam Park, which stops at various resorts including Los Cristianos, Las Americas and Costa Adeje. I don’t think that anyone reading this is planning to jump on the rides in a sequin jumpsuit (although if you do, please send pictures), however it’s a pretty active day, so ditching your itsy-bitsy-teeny-weeny for something a little more secure is a good idea. Before I left for my holiday, my friend told me the story of how her bikini bottoms went flying off on the biggest water slide! The park is incredibly clean so you’ll be fine barefoot all day, but if you’d feel a little more comfortable with some kind of footwear, I’d recommend aqua shoes as – unlike flip flops – they can be worn on all the rides. You can pick these up at the park, but it’s best to buy them online in advance to ensure a better price. No water park is complete without a lazy river and happy punters bobbing along in a dinghy. I decided that this was a nice relaxing starting point, although there is a fork in the river part way along where you can choose to take the speedy route or continue with your mellow drift. Naga Racer is a great intro to the thrill rides – you grab a mat and race down the six-lane slide on your tummy. There are a number of other mid-thrill rides such as the Mekong Rapids where you twist and turn in a dinghy with up to four people. Boa, one of the four Jungle Snake rides, was my favourite snake because you ride down a pitch-black tunnel! Many of these rides are suitable for kids as long as they’re over 1.25 metres, but for the little ones, there’s The Lost City – a well designed space with mini slides, bridges and waterfalls. I was anxious about spending a whole day going on ride after ride, but what’s great about Siam Park is the beach area, which has real sand and rows upon rows of free-to-use sun loungers. Some people looked like they’d been flopped there all day long (in which case, maybe just go to a real beach), but I found it an ideal spot to relax after lunch. There’s a beachside restaurant serving up rather pricey but tasty meals, including pizza, burgers, stir fry and grilled chicken. The beach is also home to an outdoor wave pool – when that siren goes off, get ready for some knock-you-sideways kind of waves. I don’t think I’m the kind of girl who goes around seeking challenges, but when they appear I struggle to turn them down. Recently, I was in a bar swaying modestly to the music when a stranger challenged me to a twerk-off. I had to accept, even though it resulted in me being physically flattened on the floor by my opponent – I guess that means he won. 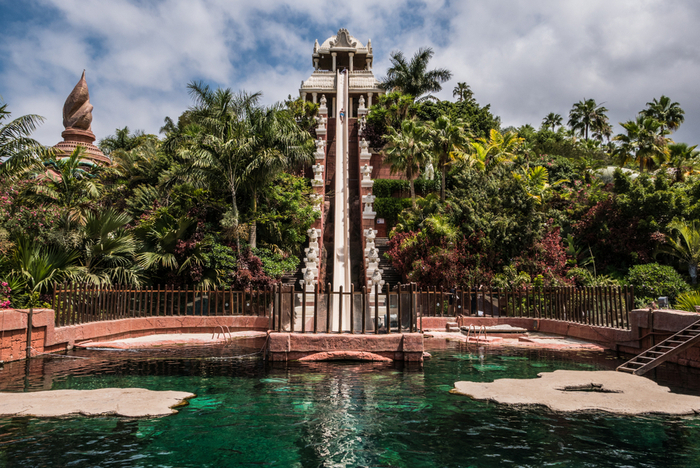 Siam Park’s challenges come in the form of big adrenaline-pumping rides. Tower of Power is an almost vertical drop slide from a 28-metre height that flies past a pool of sharks…not that I recall this as my eyes were squeezed shut. I can’t say it was enjoyable, but it wasn’t as horrific as I expected and I’m glad I did it. The Dragon is another biggie, you start with an almost vertical drop and finish by being flung out into a huge slide where you pendulum high up the sides. Visiting in low season meant we encountered hardly any queues, but the ride we waited about 10 minutes for was The Giant. For me, it was the anti-climax of the year – you essentially fall down a short flume and pop out into a massive bowl, swirling around until your float finds the middle hole and you tumble out the end. Our absolute fave was Singha, which I would liken to a watery roller coaster – it’s speedy with lots of twists, bumps and drops, and it’s possibly the longest-lasting ride. 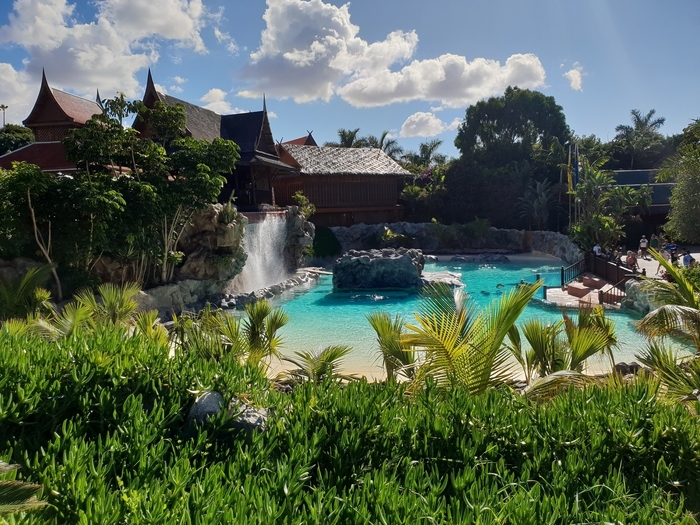 Overall, Siam Park is great value for money and whether you’re an adrenaline junkie, with the family or looking for somewhere different to catch some rays, you’ll have a fab day. ← Why You Should Book a Winter City Break to Krakow Now!